I am taking a class called Introduction to Mountaineering and this past weekend I had an amazing opportunity to go on the class field trip. It has been a challenging class, but also quite fun and clearly unlike anything I could take at Hope. And part of the fun was that the majority of my classmates are Chilean, and not a lot exchange students. Don’t get me wrong; I’ve loved hanging with other exchange students, but it was fun to do something outside of the norm. For our final, we took a weekend trip to the Andes Mountains to hike and see all the geographical phenomena that we had studied in class. We stayed in a refugio, which is similar to a hostel except it is actually the owner’s home as well. The drive there wasn’t too bad. We took a bus to Santiago, then got picked up by the National Park people to drive us the rest of the way. The journey was amazing, just seeing all the lovely mountains, the roaming horses and cows, and the rapids making their journey to the ocean. We got to the refugio and got to relax the first night. But no amount of relaxing could have prepared me for the next day. We hiked to a glacier, which was about 9 km total, at an altitude of about 4,000 meters above sea level. Needless to say, it was beautiful, but also hot and difficult. I got slightly sunburned despite putting sunscreen on four times, I was super tired, and my feet were covered in blisters, but I am so glad I went and I’m so glad I didn’t give up. It was gorgeous. I slept pretty much right when we got back to past dinner, but I wasn’t hungry. I finally went and got some tea and woke up a bit and got to hang out with all the Chilean students, who are hilarious and love having a good time. People were drinking wine and playing cards and bonding. All the people are in the same year, all about to finish up their schooling, so they all know each other pretty well. It was fun getting to know them a bit. Sunday we thought we were just going to go on a nice walk, but instead we climbed up what seemed to be a landslide of sorts. Turns out it was massive amounts of Gypsum, which was pretty cool. From there we returned back to the refugio to eat (the owner made us lunch; how sweet of her!) and relax until the van came for us at 5. It was back to Valparaiso after a really great weekend! It will be awhile before my feet recover, but I know the rest of me will never be the same. 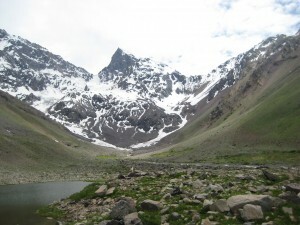 Hiking in the Andes—how amazing is that!